Contrary to what you might believe, being a dapper dude doesn't take that much a work setting. 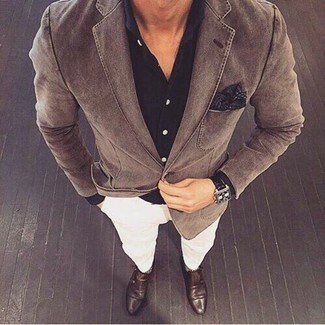 Just marry a brown cotton blazer with white chinos and you'll look wonderful. 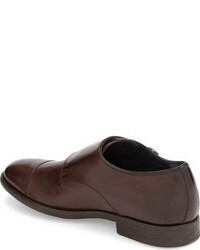 Bump up the cool of your outfit by completing it with To Boot new york exeter double monk strap shoe from Nordstrom. 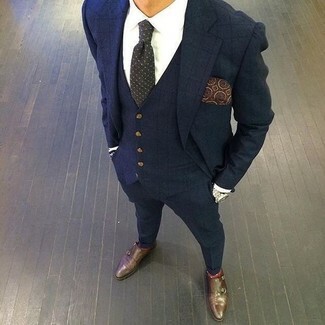 For a nothing less than incredibly stylish ensemble, wear a navy check three piece suit and a white dress shirt. To Boot new york exeter double monk strap shoe will deliver a sportier vibe to your look. 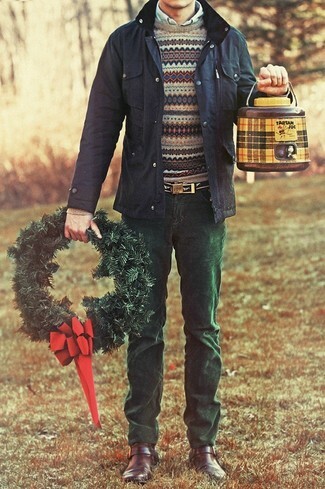 If you're hunting for a casual yet seriously stylish look, wear a navy field jacket with dark green corduroy jeans. Both pieces are totally comfortable and will look great paired together. 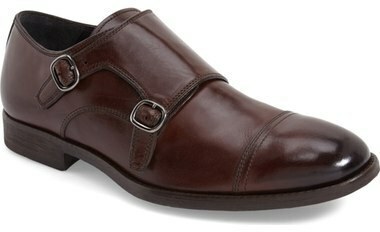 Up the ante of your look with To Boot new york exeter double monk strap shoe. If you're on a mission for a casual yet dapper outfit, try teaming an olive blazer with navy skinny jeans. Both garments are totally comfortable and will look great paired together. 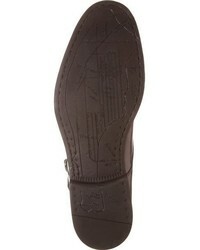 Up the cool of your ensemble by completing it with To Boot new york exeter double monk strap shoe. For a nothing less than incredibly stylish outfit, consider wearing a navy check suit and a white dress shirt. Add a sportier twist to your look with dark brown leather double monks. 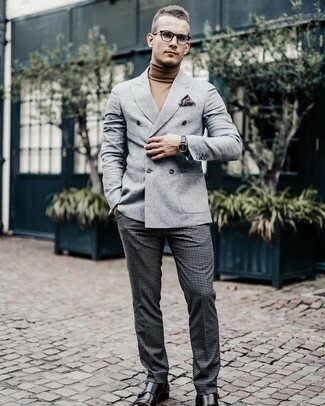 Choose a grey wool double breasted blazer and charcoal check wool dress pants if you're aiming for a clean, smart ensemble. A trendy pair of To Boot New York Exeter Double Monk Strap Shoe is a simple way to infuse a sense of stylish effortlessness into your look. As you can see here, being a dapper dude doesn't require that much effort. 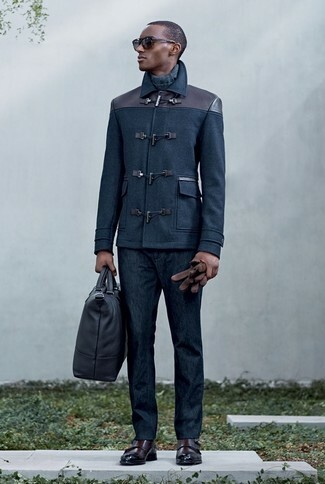 Just wear a navy duffle coat with navy jeans and you'll look amazing. Got bored with this look? Enter dark brown leather double monks to change things up a bit. 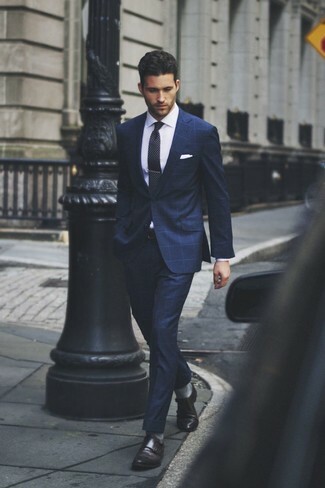 Wear a navy suit with a white dress shirt like a true gent. 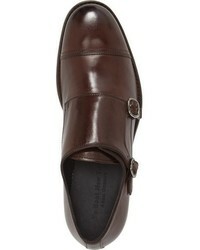 Make To Boot new york exeter double monk strap shoe from Nordstrom your footwear choice to make the ensemble current. For a smart casual outfit, team a navy blazer with white chinos — these two items play pretty good together. Kick up the cool of your look by completing it with dark brown leather double monks.